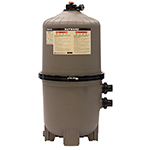 Hayward DE6020 Pro-Grid DE 60 Pool Filter | TC Pool Equipment Co.
• In-ground pool and/or spa combinations. • Pro-Grid Filter tanks are made from durable reinforced thermoplastic to meet the demands of the toughest applications and environmental conditions, including in-floor cleaning systems. • Self-Aligned tank top and bottom make access to servicing the grid elements fast and simple. • Heavy-duty, tamper-proof one piece flange clamp securely fastens tank top and bottom. Allows quick access to all internal components without disturbing piping or connections. • High impact Pro-grid D.E. elements are designed for up-flow filtration and top-down backwashing for maximum efficiency. • Uniform low-profile base enables removal of grid assembly fast and simple. • Integral manifold lift handles and low-profile base make removal of grid assembly fast and simple. • Inlet diffuser elbow distributes flow of unfiltered water evenly to all filter elements and provides even distribution of D.E. to filter grids. • 2" full-flow internal piping and plumbing for less resistance to flow and maximum performance. • 150 GPM residential flow rate. • Pro-Grid High flow, rapid release manual air relief valve bleeds air with a quick quarter turn of the lever. Pro-Grid™ vertical grid D.E. filters provide superior water clarity efficient flow and large cleaning capacity for pools and spas of all types and sizes. Constructed with high-strength reinforced thermoplastic materials, the Hayward Pro-Grid combines high-technology features and "service-ease" design for an unparalleled filtration value for both new pool and aftermarket installations. In addition Pro-Grid delivers low maintenance and dependable operation.